For the past couple years E-ink has been in an ongoing legal battle with German gadget maker Trekstor. The latter company was and is selling ereaders which incorporated screen tech which E-ink claimed violated its patents, but now two different courts have disagreed. The Bundespatentgericht (German Federal Patent Court) ruled in December that one of the patents E-ink was suing over was invalid. It confirmed the October 2013 ruling of the Mannheim Regional Court that Trekstor hadn't infringed upon this patent. In November 2012 E-ink sued Trekstor because it was selling the Pyrus Mini. 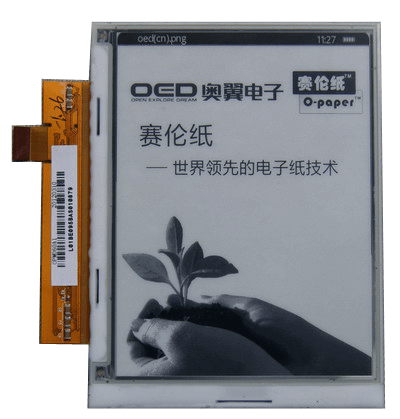 Rather than use an E-ink screen, the Pyrus Mini used a 4.3" epaper screen made by Guangzhou OED Technologies. This Chinese firm had developed epaper screens with tech similar to E-ink's proprietary tech, which it then sold to device makers. Guangzhou OED's screens were available in ereaders with 4.3", 6", and 8" screens (the company also offered 2.1" and 3.5" screens). Guangzhou OED's screens haven't shown up in major ereaders, but a number of second-tier ereader makers have used Guangzhou OED's screens, including Bookeen. The 8" screen on the Cybook Ocean was made by Guangzhou OED and not E-ink. It's not clear to this blogger why we haven't read of other lawsuits brought E-ink against other European companies; I suspect that the other companies quietly settled with E-ink and paid the license fees demanded. But I do know that the lawsuit against Trekstor did not end with this ruling. This ruling of course does not affect the other two patents involved in this lawsuit; that litigation is ongoing. One patent is being considered for invalidation, while the other is being reviewed by an expert who was asked by the Mannheim Regional Court to clarify certain issues and answer the court's questions before the case can proceed further. This might be a bit of hope that there could be some competition for E-Ink aka Prime View International. OEDtech.com can do also lightweight flexible 12inch electronic paper! Where did you see a mention of flexible? I must have missed something. Lightweight, flexible, rugged, low powered – same marketing as E-Ink/PVI. I looked at the current products, not the marketing pages, and missed that detail.